The Rocky 6167 Men's Composite Toe 6 inch Waterproof Duty Boot is the all purpose duty boot that performs well in any environment. 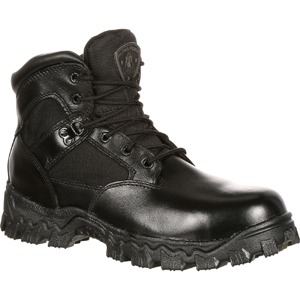 It features an upper constructed of high-abrasion denier nylon and full-grain leather with a polishable toe for a sharp uniform appearance. For maximum comfort, The Rocky 6167 features Rocky's patented Air-Port cushion footbed for excellent support and cushioning for long shifts. It also has a non-marking RigiTrac outsole with agressive treads for climbing, rappelling, or getting you over rough terrain.